I don't see Killer Shark Burst as an essential figure, but it's neat. Oh, and there's a chase version too! The trading card comes with either an etched foil border, or a standard border. The foil version ships 1 per case, and each BS-03 case has 3 sharks in it. Let me start with a little secret: I don't know what this Beast Machines Sky Darling is supposed to be called but that's what I translated it as from Amazon. I pre-ordering it not knowing what it was (because that works out so well for me), and let me tell you that it's small. 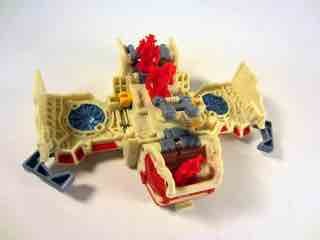 It's a cube which unfolds exactly like Starcom toys, and the motors have the same satisfying sound. 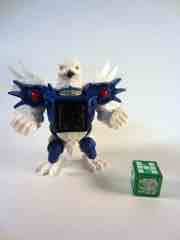 In cube mode, it's shorter than a Beast Saga figure at 2-inches tall. Let me reiterate: it's small. While disappointing from the perspective of a) bang for the buck and b) a vehicle for the 40some figures I already own, it's a fascinating toy in its own right. Like an idiot I sold off my Starcom stuff in the 1990s to raise funds for Star Wars vintage toys, but I can tell you that this one is such a trip in terms of mimicking that old style. You push a little grey circle on the top, and the dang thing spins around to become a vehicle! 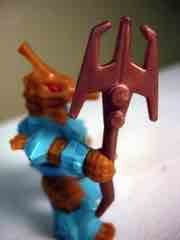 It's a crying shame this wasn't used as a mechanism for toys for the larger figures. It's quite clever. I found one name translation of this figure as General Hawk Knight. He's from Beast Saga GachaBooster Volume 1, a series of capsule figures which, according to some reports, was produced in a very low quantity so far. I have no idea if there will be subsequent runs, or if it's true, but I shelled out about $30 for the set of 6 (4 figures + 2 dice packs) on eBay. I wasn't too excited about Garrison G, and while I can say I honestly like it, it does fall short on a few accounts. Like height. He seems shorter than his brothers and (so far) sister, although he has massive arms with big, silver shoulder pads. 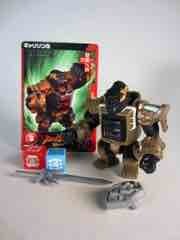 The sculpt is great, and he looks a lot like a gorilla. He doesn't really look like the original Battle Beasts Gargantuan Gorilla, and from the earlier pictures I thought he had purple armor like in the old Planet of the Apes movies. Nope! It's a light brown, which isn't bad but it in no way amuses or delights me. 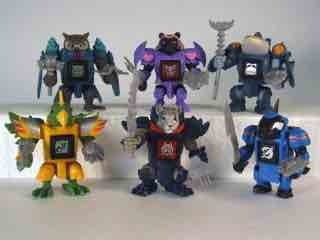 Battle Beasts Minimates Video - New! 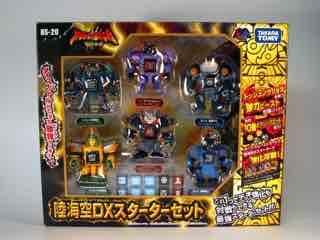 This is a new stop-motion from Diamond for their new Minimates Battle Beasts line. It’s rather well done! I like it. Now all I have to do is find the figures. You can (and should) order/pre-order wave 1 at Entertainment Earth right now. 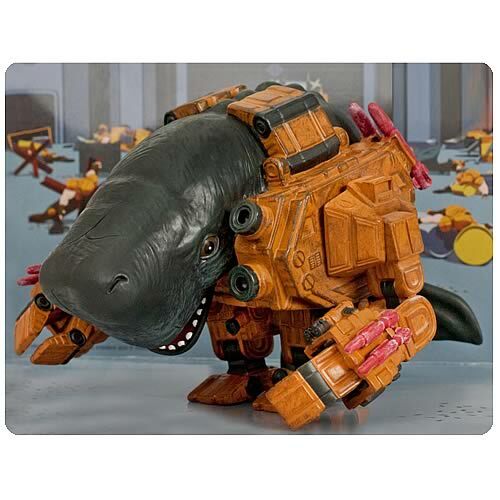 I saw the Mechawhales Vinyl Figure at SDCC last year, and while not HUGE it's certainly more substantial than your average Beast figure. At 5 1/2-inches long, it's significantly larger than the guys we usually showcase here. It's 3 1/2-inches tall, so it's a smidgen shorter than your average Clone Trooper action figure, too. The whole idea is that man has drafted Earth's whales in a fight against aliens, as they're tougher and can more easily withstand extra-terrestrial arms. This is both adorable and a handy metaphor about how man uses the Earth's seas, but mostly it's an awesome figure that looks like an ALIENS Power Loader with a sperm whale in it. You can click this sponsored link to order one at Entertainment Earth. 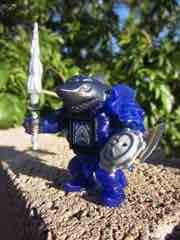 Another Battle Beasts I've had since it was first in stores, Slasher Seahorse is my buddy. It looks like we'll get at least one semi-updated version of this sea creature in Beast Saga eventually, but he ain't out yet. Let's look at an original! Like most of the vintage Battle Beasts, Slasher Seahorse manages to combine Takara's robotic eyes with an adorable house style, resulting in a collectible figure that appeals to children and adult man-children alike. His glowing red eyes don't really shine in his brown plastic head, but they contrast nicely with his blue armor complete with silver lights. Much like the fire-spitting dragons in Metroid, his snout and crest come off as cute and you're probably also just so gosh darned happy to have one that it may not bother you that his paint spray isn't terribly even, and when you have dark plastic it can show through any light paint errors much more easily. Depending on which Beast Saga translation you go with, Long Giraf is about a good of a name as any. 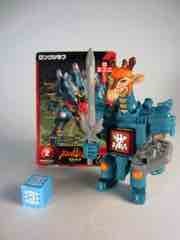 It's pretty similar to "Longrack" which was a Transformers character from the late 1990s and was also a giraffe. This figure is a more realistic take on an armored giraffe figure, and the funny thing is that the name from the manga makes me think it might be the original Battle Beasts Rubberneck Giraffe character. It's tough to say, but he does have a new swell helmet this time around. If Toys R Us doesn't get this as some sort of US exclusive, then they have failed. I wanted to get the DX Starter Set up immediately, but these damn things take forever to shoot, plus I had a bunch of completed reviews in the queue already. (Due to the awkward way I design sites, it's a lot of work to bump stuff.) So hey, it's a few weeks "late" but at least that gives me time to shoot the six buggers for one of many too-many-image reviews you'll see here. This batch of Beast Saga figures is an incredible variety pack which dumps 6 all-new figures with 6 all-new weapons in your lap.